Huge Savings Item! 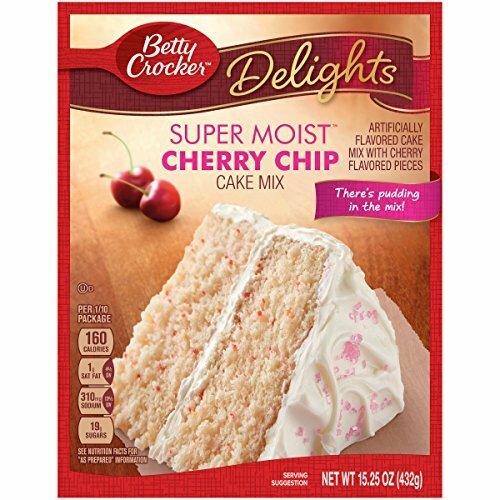 Save 19% on the Betty Crocker Super Moist Cake Mix Cherry Chip 15.25 oz Box (pack of 6) by Betty Crocker at Good Time Donuts. Hurry! Limited time offer. Offer valid only while supplies last. Bake life sweeter with Betty Crocker cake mixes. Bring a homemade taste to your next celebration by baking a fresh and delicious Betty Crocker cake. As Always...Pudding in the Mix! Bowl to Oven in minutes. Just add oil, water, and eggs. Makes one 13" x 9" pan, two 8" rounds, or two 9" rounds. If you have any questions about this product by Betty Crocker, contact us by completing and submitting the form below. If you are looking for a specif part number, please include it with your message.